My answer was, “Mencía from Bierzo.” Since then, I’ve been fortunate to visit many additional wine regions around the world, and to taste thousands of new wines each year. However, if I were asked the question again today, my answer would remain the same. This shows how strong Bierzo Mencía stands in my critical estimation, but I would prefer to have a new answer. If more wine lovers around the world had tried these wines in the intervening years, they’d now have attained the fame they deserve. I have no doubt that many readers of Wine Review Online have heard of Mencía from Bierzo and have, hopefully, tasted some exemplary renditions. Yet awareness among consumers remains almost non-existent. Sadder still, I’m know from first-hand experience that many renowned winemakers around the world haven’t even heard of the variety, and I know this because I’ve served it repeatedly when hosting them in my home, and have hauled bottles all over the world during my travels. In my role as a wine reviewer, I am aware I’m supposed to stay dispassionate about all things vinous, but I confess to being a Mencía missionary of sorts. The wine has a special place in my heart, not least because I met my wife in Bierzo, but also because I can’t help but root for an underdog variety from an obscure place--especially when it is virtually unknown but manifestly terrific. However undiscovered these wines may remain, they aren’t mere curiosities, but rather real contenders for greatness on the world stage. The best renditions already rival or surpass top offerings from Rioja, Priorat and Ribera del Duero at the very top of Spain’s quality pyramid. Given that the entire category of high caliber Mencía is only a couple of decades old, its rise to excellence is remarkable, and its eventual standing among the world’s finest wines is almost impossible to predict. Another good question suggests itself at this point: “If these wines are so outstanding, why aren’t they more widely known and appreciated? There are several inter-related answers to this. First, Bierzo is an inland zone that is relatively removed from major transportation arteries or ports, which offered important export advantages to regions such as Bordeaux for centuries. Second, Bierzo is surrounded by mountains and quite rugged in topography, which helps explain why wine was long made mostly for local consumption. Third, Bierzo’s rather isolated setting hampered economic development aside from agriculture, leading many inhabitants to emigrate and resulting in the outright abandonment of some of the steepest and best growing sites. Although high-end wine geared toward export is fairly new in Bierzo, winemaking per se is certainly not. The Romans arrived in force, conquering and expanding the pre-existing settlement of Bergidum and engaging in intensive, hydraulic gold mining (leaving behind Las Médulas, a UNESCO World Heritage site that is uncanny in being both devastated and gorgeous). As they did almost everywhere, the Romans established viticulture in earnest, which was then revived by monastic orders, especially the Cistercians in the 9th century. Religion and wine have been intertwined ever since, and not merely for sacramental purposes. The Camino de Santiago (or Way of St. James) became Christendom’s principal pilgrimage route during the Middle Ages, with the main trail running straight through Bierzo. A recent upsurge now brings more than 200,000 hikers through the notably under-populated region annually, and no doubt Mencía would be even more obscure if not for all of those pilgrims walking through the area. Much less welcome was the arrival of phylloxera, which was catastrophic everywhere but particularly cruel in Bierzo. Reviving viticulture with American rootstock was effective but very expensive, and making profits with few export outlets was virtually impossible. This was especially true for those who replanted vineyards on steep slopes at upper elevations, where yields are low but the need for labor high. Grape growing for household winemaking survived, but most of what had passed for an “industry” was destroyed. For growers who weren’t ruined immediately, short-term alternatives were at hand, as Bierzo is broadly blessed in agricultural terms. The region remains famous for apples, pears and chestnuts, but as farming became increasingly mechanized, employment opportunities withered, resulting in extensive emigration. Cooperatives provided an outlet for those cultivating vines in more fertile valley vineyards, but many of the best sites on the heights were deserted. Revival was slow in coming, and appellation status as a Denominación de Origen or “D.O.” wasn’t granted until 1989. Bierzo’s planted area remains modest at 3,000 hectares / 7,400 acres, and it is split among 2,484 growers. In light of that extreme fragmentation, it isn’t surprising that 62 percent of growers are associated with cooperatives, which are helpful for sustaining the area’s economy--but not for its reputation as a fine wine region. There was no mystery about what would be required to build a reputation from the ruins: restoring old vineyards and making wine worthy of the amazing fruit they can produce. This challenge has been taken up by roughly 70 intrepid wineries that have struggled to bring honor to Bierzo’s name by exporting at least some of their production. Many of them are quite new enterprises, and some of the very best are fewer than 20 years old. Their fight for recognition--and their very novelty--indicate that Bierzo is a tough place to make money. But their best bottles prove it is a great place to make superb wine. Bierzo is situated in the Sil Valley, located in the extreme northwest corner of Castilla y León, bordering Galicia to the west and Asturias to the north. Ringed by mountains, it strikes the visitor’s eye as a well-defined bowl, though locals are quick to correct this, likening it instead to a pot. Why this should be a matter of dispute is unclear, but everybody agrees that quality stems directly from the very old, low-yielding vines perched at elevations of 500 – 1,000 meters / 1,500 – 3,000 feet. Fully 75 percent of the vines in the region are Mencía, and yet the importance of this variety to Bierzo certainly exceeds three-quarters. Godello plantings have reached 5 percent, but tellingly, Palomino still accounts for more than three times that. Any doubt regarding varietal dominance is dispelled by the fact that the D.O. has copyrighted the phrase, “The Land of Mencía” as its slogan. Copyrighting this was probably born of an over-abundance of caution, as no other region could plausibly lay claim to the title. 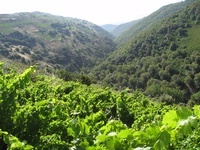 DNA profiling shows that Jaen du Dão in Portugal is identical to Mencía, but the vines there are much less varied genetically than in Bierzo, strongly suggesting that cuttings were taken there from Spain. In Galicia, some Mencía is grown in the D.O.s of Ribeira Sacra, Monterrei and Valdeorras, but there’s no question that the variety’s center of gravity is in Bierzo. The region’s growing conditions could hardly be better suited to Mencía. Vulnerable to wind damage, the vines are sheltered by Bierzo’s mountains, which also reduce rainfall from the Atlantic that would otherwise prey upon Mencía’s susceptibility to botrytis. It buds early but benefits from an extended growing season, so Bierzo’s climatic distinctness from the extremes of cold and heat across Spain’s broad Meseta plateau is definitely beneficial to Mencía. Early budding also entails the risk of spring frost, which hit hard in 2017, though cold air tends to roll downhill, usually sparing the prized old vines on the heights. 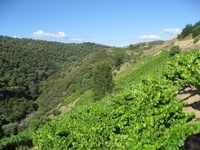 Regarding that distinctive climate, Bierzo has both maritime and continental conditions. Interestingly, those two influences wax and wane from vintage to vintage, and even from one sector of the region to another within a single growing season. Some years produce a preponderance of rich, ripe wines, whereas cooler years with more Atlantic influence have led inexperienced tasters to pigeonhole Bierzo Mencía as a bright, lighter-bodied wine. The more comprehensive fact of the matter is that these wines can be either big or bright, depending on vintage and vineyard, or big and bright at once--which is when they are most astonishing. In prime, high elevation vineyards, vines are cultured almost exclusively en vaso (or in “bush vine” mode), with all pruning and picking performed by hand. Slate and calcareous clay soils predominate, along with rocky patches of granite and quartzite. This translates into quick drainage of the roughly 650 millimeters / 25 inches of annual rainfall, just as low organic content of about 1 percent in the soils results in conspicuously low yields. How low? As little as a pound of grapes per vine…maybe two. Getting a pound of grapes per vine doesn’t sound like an attractive investment pitch, but investing in Bierzo’s old Mencía vines is exactly what some of Spain’s best wine minds have chosen to do. Among them are Alvaro Palacios (famed for wines from Priorat and Rioja) and his talented nephew, Ricardo Perez, who together established Descendientes de J. Palacios. They are now building a jaw-dropping new winery to go with their amazing old vineyards, and just for the record, bottles of their single-vineyard La Faraona from Bierzo now sell for higher prices than Palacios’ L’Ermita--Priorat’s most expensive wine. Also on the list are Eduardo and Alberto García, sons of Mariano García (revered winemaker for decades at Vega Sicilia and founder of Aalto, Mauro and Maurodos in Ribera del Duero and Toro). With consultation from Mariano, the García brothers partnered with Alejandro Luna of Bierzo’s excellent Bodegas Luna Beberide to buy old vines to create Paixar, one of Bierzo’s most highly prized wines. Additionally, once the Rías Baixas-based Terras Gauda group established its outstanding Pittacum bodega in Bierzo, major investments were officially flowing in from all points of the Iberian compass. Raúl Pérez offers a different sort of testimonial to Bierzo’s potential for global stardom, in that he got his start in Bierzo (at his family’s winery, Castro Ventosa). He is now among the world’s most sought-after winemakers, involved in projects in at least five other Spanish regions plus Chile, Argentina, South Africa, Portugal and Bordeaux. But when deciding where to establish his own eponymous winery…Bierzo was his choice. Perez’s example is important as a corrective to the possible perception that Bierzo’s rising reputation was the handiwork of outsiders. That would be a misperception, despite the importance of investment funds and expertise in winemaking and marketing from other quarters. Denizens of Bierzo certainly didn’t need to be told that their Mencía could make outstanding wine, though they clearly appreciate help in getting out the word. It would be easy enough to go green with envy regarding the likes of Alvaro Palacios, but I’ve never heard a single native of Bierzo describe him as anything but a benefit to the region. In addition to Paixar and wines from Descendientes de J. Palacios, Pittacum and Raúl Pérez, the following producers make exemplary wines that are reasonably attainable in the USA: Casar de Burbia, Estefanía (Tilenus), Luna Beberide, Luzdivina Amigo and Vinos Valtuille. More difficult to find but well worth a search (or augmented representation by importers) are: del Abad, Adriá, de Arganza, Castro Ventosa, Dominio de Tares, Estévez, Godelia, Merayo, Palacio de Canedo, Pérez Caramés, Peique, Ribas del Cúa, Tenoira Gayoso and La Vizcaina. If you join my missionary quest to introduce others to Mencía from Bierzo, you’ll quickly encounter requests to liken it to wine types with which your customers or friends are more familiar. Burgundy has also been suggested, and Mencía can indeed show considerable refinement, for which Pinot Noir is obviously supremely famous. Although no region could take offense at having its wines likened to Burgundy’s, Mencía from Bierzo usually shows more intensity and muscle than the comparison can bear. Beaujolais has also been said to be similar, and un-oaked Mencía can be comparably open and fruity, though old vine renditions with significant exposure to oak are much “punchier” than almost any Cru bottlings of Beaujolais. The most likely resemblance may be to Syrah from the northernmost Rhône, specifically, Côte-Rôtie. These can suggest a sensory kinship with Mencía (though not a genetic one) in that both can be very expressive in aroma and flavor even when only moderately weighty. Additionally, both can show fresh acidity even when the fruit is fully ripe. Scents recalling violets are often found in both, along with a broad flavor spectrum including blue, red and black fruit tones. In the last analysis, though, Mencía from Bierzo is truly most compelling because it can be a superb wine in its own right, with its own distinctive character. Being curiously late to announce itself at the gateway to global greatness, the temptation to compare it to other important wines seems quite natural. However, it is worth remembering that efforts to actualize Mencía’s full potential have only been underway for one generation--maybe two at most. Only the future can tell us how good Mencía from Bierzo can become, but these wines can already tell us something about the future: it will be exciting in part because Mencía won’t be the last variety to rise from obscurity to excellence.